Learn how to create and delete a virtual network and change settings, like DNS servers and IP address spaces, for an existing virtual network. If you're new to virtual networks, you can learn more about them in the Virtual network overview or by completing a tutorial. A virtual network contains subnets. To learn how to create, change, and delete subnets, see Manage subnets. If you don't already have an Azure account, sign up for a free trial account. If using the portal, open https://portal.azure.com, and log in with your Azure account. If using PowerShell commands to complete tasks in this article, either run the commands in the Azure Cloud Shell, or by running PowerShell from your computer. The Azure Cloud Shell is a free interactive shell that you can use to run the steps in this article. It has common Azure tools preinstalled and configured to use with your account. This tutorial requires the Azure PowerShell module version 1.0.0 or later. Run Get-Module -ListAvailable Az to find the installed version. If you need to upgrade, see Install Azure PowerShell module. If you are running PowerShell locally, you also need to run Connect-AzAccount to create a connection with Azure. If using Azure Command-line interface (CLI) commands to complete tasks in this article, either run the commands in the Azure Cloud Shell, or by running the CLI from your computer. This tutorial requires the Azure CLI version 2.0.31 or later. Run az --version to find the installed version. If you need to install or upgrade, see Install Azure CLI. If you are running the Azure CLI locally, you also need to run az login to create a connection with Azure. The account you log into, or connect to Azure with, must be assigned to the network contributor role or to a custom role that is assigned the appropriate actions listed in Permissions. Select + Create a resource > Networking > Virtual network. Name: The name must be unique in the resource group that you select to create the virtual network in. You cannot change the name after the virtual network is created. You can create multiple virtual networks over time. For naming suggestions, see Naming conventions. Following a naming convention can help make it easier to manage multiple virtual networks. Although you can define only one address range when you create the virtual network, you can add more address ranges to the address space after the virtual network is created. To learn how to add an address range to an existing virtual network, see Add or remove an address range. If a virtual network has address ranges that overlap with another virtual network or on-premises network, the two networks cannot be connected. Before you define an address range, consider whether you might want to connect the virtual network to other virtual networks or on-premises networks in the future. Subnet name: The subnet name must be unique within the virtual network. You cannot change the subnet name after the subnet is created. The portal requires that you define one subnet when you create a virtual network, even though a virtual network isn't required to have any subnets. In the portal, you can define only one subnet when you create a virtual network. You can add more subnets to the virtual network later, after the virtual network is created. To add a subnet to a virtual network, see Manage subnets. 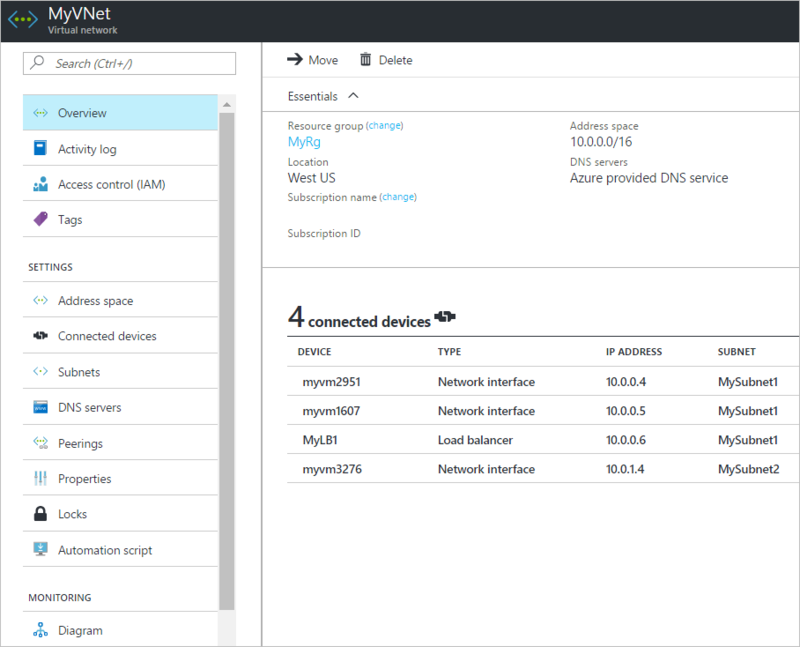 You can create a virtual network that has multiple subnets by using Azure CLI or PowerShell. Sometimes, administrators create different subnets to filter or control traffic routing between the subnets. Before you define subnets, consider how you might want to filter and route traffic between your subnets. To learn more about filtering traffic between subnets, see Network security groups. Azure automatically routes traffic between subnets, but you can override Azure default routes. To learn more about Azures default subnet traffic routing, see Routing overview. Subnet address range: The range must be within the address space you entered for the virtual network. The smallest range you can specify is /29, which provides eight IP addresses for the subnet. Azure reserves the first and last address in each subnet for protocol conformance. Three additional addresses are reserved for Azure service usage. As a result, a virtual network with a subnet address range of /29 has only three usable IP addresses. If you plan to connect a virtual network to a VPN gateway, you must create a gateway subnet. Learn more about specific address range considerations for gateway subnets. You can change the address range after the subnet is created, under specific conditions. To learn how to change a subnet address range, see Manage subnets. Subscription: Select a subscription. You cannot use the same virtual network in more than one Azure subscription. However, you can connect a virtual network in one subscription to virtual networks in other subscriptions with virtual network peering. Any Azure resource that you connect to the virtual network must be in the same subscription as the virtual network. Resource group: Select an existing resource group or create a new one. An Azure resource that you connect to the virtual network can be in the same resource group as the virtual network or in a different resource group. Location: Select an Azure location, also known as a region. A virtual network can be in only one Azure location. However, you can connect a virtual network in one location to a virtual network in another location by using a VPN gateway. Any Azure resource that you connect to the virtual network must be in the same location as the virtual network. In the search box at the top of the portal, enter virtual networks in the search box. When Virtual networks appear in the search results, select it. From the list of virtual networks, select the virtual network that you want to view settings for. You can move a virtual network to a different subscription or resource group by selecting Change next to Resource group or Subscription name. To learn how to move a virtual network, see Move resources to a different resource group or subscription. The article lists prerequisites, and how to move resources by using the Azure portal, PowerShell, and Azure CLI. All resources that are connected to the virtual network must move with the virtual network. Address space: The address spaces that are assigned to the virtual network are listed. To learn how to add and remove an address range to the address space, complete the steps in Add or remove an address range. Connected devices: Any resources that are connected to the virtual network are listed. In the preceding screenshot, three network interfaces and one load balancer are connected to the virtual network. Any new resources that you create and connect to the virtual network are listed. If you delete a resource that was connected to the virtual network, it no longer appear in the list. Subnets: A list of subnets that exist within the virtual network is shown. To learn how to add and remove a subnet, see Manage subnets. DNS servers: You can specify whether the Azure internal DNS server or a custom DNS server provides name resolution for devices that are connected to the virtual network. When you create a virtual network by using the Azure portal, Azure's DNS servers are used for name resolution within a virtual network, by default. To modify the DNS servers, complete the steps in Change DNS servers in this article. Peerings: If there are existing peerings in the subscription, they are listed here. You can view settings for existing peerings, or create, change, or delete peerings. To learn more about peerings, see Virtual network peering. Properties: Displays settings about the virtual network, including the virtual network's resource ID and the Azure subscription it is in. Diagram: The diagram provides a visual representation of all devices that are connected to the virtual network. The diagram has some key information about the devices. To manage a device in this view, in the diagram, select the device. You can add and remove address ranges for a virtual network. An address range must be specified in CIDR notation, and cannot overlap with other address ranges within the same virtual network. The address ranges you define can be public or private (RFC 1918). Whether you define the address range as public or private, the address range is reachable only from within the virtual network, from interconnected virtual networks, and from any on-premises networks that you have connected to the virtual network. You can decrease the address range for a virtual network if you don't have any subnets associated with it. Otherwise, you can only extend the address range, for example, changing a /16 to /8. You could begin with a small address range, and then extend it later or add additional ranges. From the list of virtual networks, select the virtual network for which you want to add or remove an address range. Select Address space, under SETTINGS. Add an address range: Enter the new address range. The address range cannot overlap with an existing address range that is defined for the virtual network. Remove an address range: On the right of the address range you want to remove, select ..., then select Remove. If a subnet exists in the address range, you cannot remove the address range. To remove an address range, you must first delete any subnets (and any resources in the subnets) that exist in the address range. From the list of virtual networks, select the virtual network for which you want to change DNS servers for. Select DNS servers, under SETTINGS. Default (Azure-provided): All resource names and private IP addresses are automatically registered to the Azure DNS servers. You can resolve names between any resources that are connected to the same virtual network. You cannot use this option to resolve names across virtual networks. To resolve names across virtual networks, you must use a custom DNS server. Add an address: Adds the server to your virtual network DNS servers list. This option also registers the DNS server with Azure. If you've already registered a DNS server with Azure, you can select that DNS server in the list. Remove an address: Next to the server that you want to remove, select ..., then Remove. Deleting the server removes the server only from this virtual network list. The DNS server remains registered in Azure for your other virtual networks to use. Reorder DNS server addresses: It's important to verify that you list your DNS servers in the correct order for your environment. DNS server lists are used in the order that they are specified. They do not work as a round-robin setup. If the first DNS server in the list can be reached, the client uses that DNS server, regardless of whether the DNS server is functioning properly. Remove all the DNS servers that are listed, and then add them back in the order that you want. Change an address: Highlight the DNS server in the list, and then enter the new address. Restart the VMs that are connected to the virtual network, so they are assigned the new DNS server settings. VMs continue to use their current DNS settings until they are restarted. From the list of virtual networks, select the virtual network you want to delete. Confirm that there are no devices connected to the virtual network by selecting Connected devices, under SETTINGS. If there are connected devices, you must delete them before you can delete the virtual network. If there are no connected devices, select Overview. To confirm the deletion of the virtual network, select Yes.